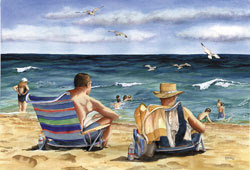 This is a piece called, Beach Boys, which I painted last year. It is currently at the Beverly Art Center, in Chicago, IL for a group exhibit. Each year my husband, who was raised in Fort Lauderdale, Florida, and I go back to the sunny state to visit his family at Christmas time. We always try to make a pilgrimage to the beach while we are there. I always have my camera and sketchbook, and that is how this painting came into being. I used five or six of the photos I had taken for reference. Then put them together for this piece. It is 33" x 44" inches, so it's pretty big for me, but what fun it was to paint! I painted it during the depths of winter in Michigan and it warmed my heart. The funny thing is that last spring I took it to a few art fairs and while in Birmingham a woman and her husband stopped by and asked where I got the picture of her son and dad! Well, it turns out her son lives in California - there was just an uncanny resemblance to the character in my painting! She ended up purchasing a limited edition print to send to her son. I never cease to be amazed at the stories like this I hear from people who see my work! To see more of my work visit my website by clicking here.